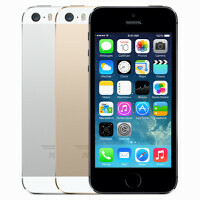 How would you like to score a free 16GB Apple iPhone 5s this Memorial Day weekend? Starting today through Monday, you can turn a working handset into Apple's current flagship phone. Here is how it works. Trade in a working smartphone of any brand and receive at least $100 from Best Buy. Then, you can turn around and use that money to buy the iPhone 5s, which is priced at just $99.99 at Best Buy over the holiday weekend. The deal is available for those who are customers of AT&T, Verizon and Sprint. The phones being traded in must work, be free of any water damage, and the screen cannot be cracked. If the phone being traded in is deemed to be worth more than $100, you will receive the difference in a Best Buy gift card. If you're unhappy with your current handset, or have been dying for an Apple iPhone 5s, here is your opportunity to trade for the device for free. Just keep in mind that within months, your 4 inch iPhone will be replaced by a model with a larger screen. I paid full price at ATT then left to T-mobile. As a high school student its everything they could want in smartphone. No, it's everything YOU could want. Not everyone likes what you like child. One thing that will help you out tremendously in life is understanding that different people have different preferences. The aesthetics of a certain product are more appealing to some more than others, and vice versa. If you can take a more objective position, more people will listen to your contentions. Nobody wins an argument, and that's why I seldom comment here. There's nothing "fanboy"-ish about his comment, he's saying what I did in the beginning of my comment. You are of the opinion that android is the best phone; for him, Apple. I really don't see why this is such a heated debate. I am yet to encounter one in these forums that has a financial vested interest in either of these companies, whose livelihood is at stake. Ah, a voice of reason! Refreshing. I'm an early adopter of Android, as it was recommended to my husband and me by an AT&T sales clerk. (with an unlocked iPhone) after he listened to us describe what we wanted in smartphones. Our first phones were train wrecks (anyone remember theMotorola Backflip? LOL), but they improved over time, and I'm quite happy with my Note 3. However, I understand and appreciate the fact that every smartphone user needs to tailor their choice of OS to their needs, and that it's ridiculous to judge. That's right CHILD, you tell em' 2 snaps; a circle; and the all improved Z with a twist - go on CHILD! Not really. For high school, most have an iPhone cuz it does what we use it for. Android is more of a work type phone. Not a fanboy because i've had both and like both. No offense taken. I agree, most choose it for the cool factor and thats why many start hating iPhones. But overall, it does the job for most highschoolers. We don't really need to use all the perks android has to offer. Not everything Alot of things are missing Your in Apple's world which has halfbaked products Ios7 stolen and taken feautres from Android, dropdown notification There are lots of missing feautres which will be added on every ios update When will you see the real life and freedom How many days left… . Let's not talk about copying because every os copies other os. You're kidding right? Everything in Android is 100% original. Of course not, just evening in iOS isn't. The difference is Android doesn't apply for patents on what they've taken from others and use them to ban competition. That's my only issue with Apple. If they'd just stop the legal douchebaggery, I'd have no issue with them. When I was in high school we had land lines and payphones. But shortly after high school I had a bag phone. That was fashionable! And expensive - no bundled minutes, you paid a monthly fee plus a per minute free for every call. It makes me laugh seeing how Best Buy considers trading in something of value as "for free". If I already didn't own this beauty, I'd be all over it. Its true this beauty, unlocked a bright future for smartphones. I can't wait till PA discovers he's actually TrollTM and bans him again. Bucky, let him rant till he shoots himself in the foot. And lose your unlimited data?